A Meteorology Expert With A Columbia U. Degree Brings Modern Forecasts To The Farmers Of Senegal : Goats and Soda Armed with a Ph.D from Columbia University, Ousmane Ndiaye wants to tell farmers when the rain will (and won't) fall. But he's the first to say he's not always right. Ousmane Ndiaye loves computer models, climate forecasting and babies. Here he holds farmer Mariami Keita's 4-month-old baby girl, Ndeye. Climate change can affect everything from air and ocean temperatures to weather and disease. In Senegal, one man has made it his mission to connect communities with information that might affect their distant future but also their immediate reality. Tall and imposing, with a ready smile and a big voice, Ousmane Ndiaye heads the research and application group at the National Civil Aviation and Meteorology Service in Senegal (ANACIM). The group deals with both planes — and weather. 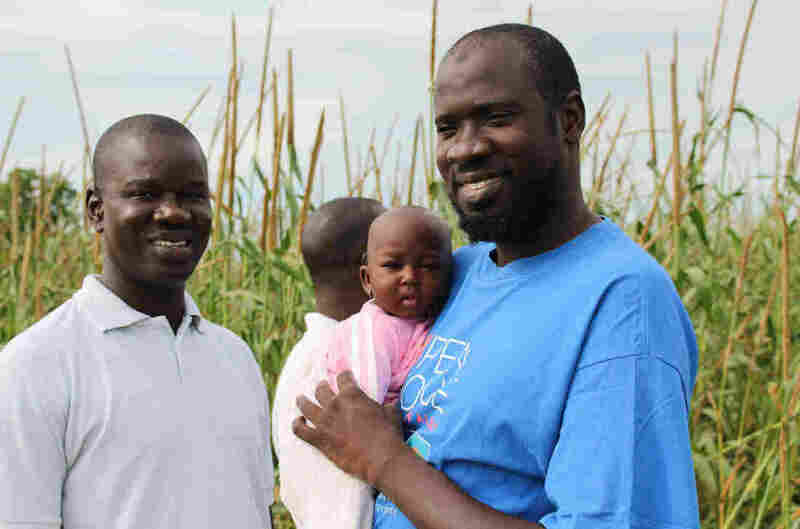 The 44-year-old father of six, who's an expert on seasonal and monsoon forecasting, aims to foster dialogue between climate and weather experts and the Senegalese with the hopes of enabling and encouraging farmers, herders and health workers, among others, to use climate information and related farming tips in their decision making. Ndiaye studied meteorology engineering and physics, then went on to get a Ph.D from Columbia University. Now he's brought his knowledge home and is passionate about sharing it. In a wide-ranging conversation, he told NPR about the challenges and rewards of working in Senegal. His answers have been edited for length and clarity. Tell me how you came to do meteorological studies. How did you get into meteorological sciences and climatology? At the beginning, I was dragged in because I see that the weather is important for planes, I see people working at the airport and this and that. But after doing the training, I realized that weather is more than that. The weather is our way of living. I mean, the way we dress, the way we build houses, you know. Some people even argue that the color of our skin is dependent on the climate. We don't realize it. But climate is really everywhere in our life. Diseases like malaria happen in some areas in Africa because the climate is imposing that. So there are more climate-related diseases. Also, rain-fed agriculture depends on climate. The energy sector also depends on wind and renewable energy. So I got really excited about that. As a meteorological specialist who is now applying all that knowledge so that farmers get better yields, better harvests, more crops — how does that feel? I mean, it feels good. The happiness, the joy that I get seeing that farmers are getting something more, or at least avoiding some disaster due to climate information that we provide, gives us happiness.It's like a doctor working with his patient. The relationship becomes more than social — and this side is very important for me, at least to bring something in our community. Because this community is suffering a lot. Education is a problem. Health is a problem. Also getting income is a problem, due to climate. What else are you considering in addition to farming? Disease. Malaria is one and Rift Valley fever is another one. I work a lot with malaria and am part of the national malaria program, which is part of the Ministry of Health. My research is to see how malaria-prone areas will develop or change based on climate change, because we know that climate change will affect those zones. Some areas will get more rain and others less — and for malaria, in particular, temperature and rainfall are very important. Tell us a bit about the frustrations. You say that sometimes you came up with a project that failed or wasn't the right fit or relevant. It was products that failed. Or sometimes it was that you'd get a good forecast, but you were kind of hesitating. Shall I give it or not? Because that's what goes round in your mind. If I tell farmers that the forecast is going to be like this — and it doesn't happen — these are huge things to think about. You mean you thought the rain might fall but weren't sure? Exactly. You see the heavy rain forecast in 10 days' time and you see the next day after, there's the likelihood of rain. But you hesitate, because some models are saying no, but most of the models are saying yes. Sometimes, farmers lose a lot. And you say, 'This is my fault, I could have given this information.' And also the other way round. And those things affect you. So you see that that expectation is very, very high about what you can do in science. And sometimes you get frustrated, because our governments are poor. You can understand, they have their priorities elsewhere. So they cannot invest in what this climate science needs. One day we were looking — I mean it's the dry period and you don't expect any rain. But many models were telling us there was the likelihood of rain in Senegal. And if you look at the rain path, you could see that it was in Kaffrine. So we just told the farmers, 10 days before the rainy event, that on March 25, 2014 — I will not forget that date — there's a likelihood of rain. So what did they do? They went to cover the harvested crops. And afterward, I got a phone call from farmers who are not part of our project, who said 'you saved me millions.' I mean, the season can be good, you can have nice harvests, but you can lose it in one day due to the rain coming after the rainy season. You seem to have an excellent working relationship with farmers and communities. This relationship is really a social relationship. It's personal. It's not just a technician coming from the Met Service coming to train people and go. No. It's a long-term partnership. We discuss, we consult, we talk on the phone, we talk about a lot of things. When you go to give the forecast, (you) discuss with people, engage with them. There is no price for it. You know their families, you know the names of their children, you know the problems they live with. You've got to know these communities really well, haven't you? It's not the climate scientist from out of town and the villagers. Like a father talking to a son? Now talk to me a little bit about traditional vs. modern technology. Yes. Climate variability has existed for a long time. When the farmers were planting they always were dealing with climate variability. So farmers were trying, before science, to deal with this. Trying to know what is the best way of knowing what the climate will be. In their own culture, there is already somebody who can know the future. The future climate. And this is well known in this area, it's called 'xoy.' Xoy is kind of, it's in Wolof, and 'xoy' means just a ceremony, when all those people who have mystical knowledge will get together and tell what the season will be, what the coming season will be. They forecast the season based on mystical knowledge. We have to find out ways, touching base with them, so they will not see us as something new, something strange. So what we do is we start documenting this knowledge and we find out there is the 'xoy' — what you call the mystical knowledge. There is also bioclimatic knowledge. So farmers can tell that [conditions are] not going to be good, based on behavior of birds, the blooming of plants and also appearance of certain lizards and how the water will appear in some rivers or not. Those kinds of stuff. Tell us more about the birds and the winds. Farmers can tell you if the wind is changing direction, for example [indicating when] the rainy season is starting. Some farmers tell us if the bird builds his nest under the branch, it means the season is going to be very rainy. And if the bird builds his nest on top of the branch, it means it's okay, it's a normal year. All those things they were observing from year to year in the tradition from father to son. So we were trying to tell them, 'Okay, use those indicators. We also have indicators. We use those kinds of instruments that can tell us exactly what the atmosphere is. And we can tell you more accurately what this thing is.' And also, your knowledge is based on memory. So something is lost along the way. And us — we record everything on paper, on computer, in storage. And we can always go back and find out exactly when things happened. So that discussion is very important. Farmers will see we are not imposing something new. We are just trying to find a middle ground. And, of course, during this period the two things exist. They keep doing their xoy and tell us what the next season will be — and also we are using state-of-art science. And we will compare. But, of course, sometimes the meteorological office is wrong! Exactly, exactly. We have uncertainties in the climate forecast. Climate forecasts, climate models are very complicated. I mean, imagining how the world would behave, how the globe's atmosphere will behave in a few months is challenging. There is room for error. We will not say to the farmers, 'This is what will happen.' We will say, 'There is more likelihood to have that.' They have also uncertainties. Some farmers can tell, this indicator – for example, the baobabs are blooming very early — means that the rainy season will be good. But someone will say — I see a bird, when I see it, usually, it means a dry season.